The Toyota Avensis was never a racer. Until last year. Now, another action-fuelled season of the Dunlop MSA British Touring Car Championship begins this weekend, with the new-look Toyota Avensis BTCC car ready for racing in the hands of Toyota’s independent racers Frank Wrathall, Tony Hughes and Adam Morgan. The new car is based on the latest update of the British-built road-going Avensis, introduced late last year. Like its showroom sister, the race car is produced at Toyota’s Burnaston factory in Derbyshire, making it a very British contender in the country’s most popular national racing championship. With its restyled and re-engineered front end, the Avensis racer looks very different to the car which made its BTCC debut last season as one of the first of the ‘Next Generation Touring Cars’. The redesign has allowed the engineers of Dynojet Racing and Speedworks Motorsport to take a fresh look at engine installation and cooling, and has also helped them improve chassis stiffness. Dynojet’s Wrathall is hoping to build on the dramatic late-season form he showed in 2011 and believes the off-season works carried out in the team’s Lancashire workshops will make all the difference. “The developments we have made will allow us to move on to the next level,” said the 25-year-old from Garstang, last season’s Rookie of the Year. Frank scored four podium results in 2011, the best of them a second, and three Independents Trophy wins on his way to championship 12th. His sterling efforts have been recognised by the British Racing Drivers’ Club, which has awarded him SuperStar status for the coming year. The newest recruit to the Toyota ranks is 23-year-old Adam Morgan, who won his place on the BTCC grid thanks to his victory in the Ginetta Supercup – the richest prize in British motorsport, worth in excess of £200,000. Tony Hughes is raring to go also: “I think the car will work well this year. My target is to try to finish as many races as possible and to try to get a top-10 finish – that would be like a win for me,” said the 54-year-old from Alderley Edge, Cheshire. 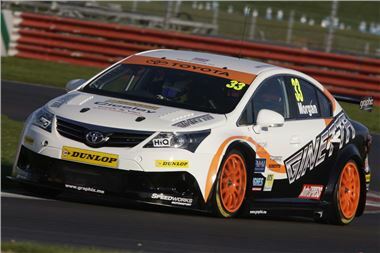 Both the Speedworks Toyotas are powered by the 2-litre ‘spec’ engine developed by BTCC organiser TOCA. This year’s Dunlop MSA British Touring Car Championship starts and finishes at the Brands Hatch circuit in Kent, and between those 1 April and 21 October events will visit the Donington Park, Thruxton, Oulton Park, Croft, Snetterton, Knockhill, Rockingham and Silverstone circuits on its round-Britain tour. All 30 races will be screened live, with a minimum of six hours on ITV4 and ITV4 HD from each meeting, simultaneously broadcast on the itv.com website.